Arnell Ando' Art at www.arnellart.com. I recently received a simply divine 78-card Tarot deck and book set from this gifted artist in Cape Town, South Africa. I was immediately struck by the intricate, symbolic altars in the imagery, which she painstakingly created for each card with great purpose and attention to detail. Even a heathen like me could feel the artist's sincere devotion to the subject matter and her deep reverence for Mary. Every card depicts a small, hand-crafted, wooden shrine with a miniature diorama dedicated to an archetype or an initiation into theGreat Mystery, while revealing a vignette woven into this rich, meaningful tapestry dedicated to the sainted mother of Jesus. The four suits of this deck correspond with the four elements and four cycles of Mary's life: Virgin and Priestess is denoted by the suit of Vessels (Water, Cups); Beloved and Bride, is the suit of Holyrood (Fire, Wands); Mother and Sacred Woman is represented by the suit of Distaff (Air, Swords) and Wisdom is attributed to the suit of Roses (Earth, Pentacles). The cards were professionally photographed and printed in a large format (5"L by 3.75"; W, 12.7 cm by 9.5 cm) on sturdy cardstock and would work nicely for readings or as one's daily card meditation (also serving to study her personal associations and interpretations). The 160 page, soft-cover book goes into great detail about each card, while sharing stories with historical and mythological context and analogies. Each limited edition set is signed by the artist and comes beautifully packaged, including a unique cloth pouch in the style of the deck, adorned with a St. Mary amulet and a rosary, for a distinctive and enticing presentation. Alternatively a version with a handcrafted box relating to the iconography of this deck may also be available upon request from the creator. And an expanded version of the guidebook became available in early 2017. 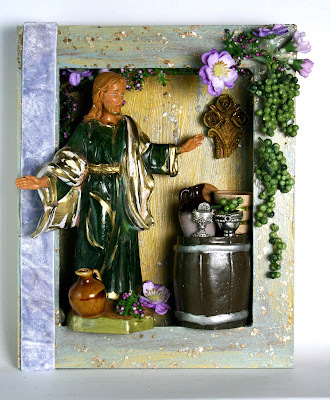 Ms. Grobler surmises that we currently recognize Mary as the Mother of Jesus, playing a small part in the story as told by Protestant Christianity or having a more significant role in the Roman Catholic tradition. However Mary is less known as a goddess in the feminine traditions and few would connect her with the great Mother Goddesses of distant past or as the Lady Sophia in the Wisdom traditions. But to the creator of this deck and others like her, there is an underlying red thread of connection. Since the ancient divine feminine became demonized many moons ago and her stories went underground, one must rely on myth, fairy and folk tales, oral traditions and subtle clues to uncover Her story. Grobler adds that if we dig deeper, we can discover that many of the titles belonging to Mary used to also be attributed to ancient goddesses in various cultures and traditions and that even the name 'Mary' has been known to signify a title, such as 'Priestess', beyond being used as a personal name. Ms. Grobler goes on to state that the history of both the power and eradication of the Divine Feminine as an ideology have been suppressed and hidden by each subsequent ruling power throughout time, until she was at last removed from any meaningful role in religion and thereby relegated to only a minor part in the story. I'm reminded of another sacred Tarot offering to Mary in the form of a Major Arcana deck, created by Morena Poltronieri of the Tarot Museum, (in Italy). In 2013 Ms. Poltronieri made a spiritual journey to Montserrat, (near Barcelona, Spain). During that mystical pilgrimage she came upon 22 shines and alters dedicated to Mary and realized a correlation to the 22 Trump cards and thus created the deck,Maria - 22 Madonnas of Montserrat. And like a kindred spirit, Morena also relates Mary to the divine, eternal Goddess (as she has shared in various texts including theTarot Travel Guide of Italy). So in this thoroughly researched project, the artist set out to collect ancient legends, myths, fairy tales and stories from a wide range of sources and cultures and arrange together the pieces of the puzzle which contribute to a fuller revelation of the archetype of Mary. This visionary deck is a heartfelt offering from the artist and a powerful source of inspiration and imagination. It therefore becomes another healing way to reconnect with the inner Goddess and see oneself in her divine light with compassion and insight. The edges of these cards are a muted gold and the variety of colorful borders make for a visually stunning presentation, while highlighting the intricate shrines. Traditional symbolism associated with the Tarot can be found in the cards, albeit in often mysterious, symbolic ways, that are explained in the accompanying guidebook. The Major Arcana have traditional Roman numerals but the card titles are unique to this deck's theme (although most are recognizable to the seasoned Tarot student). The more familiar titles are included in the guidebook for easy reference. Strength is represented by card VIII in this deck and Justice as XI (following the Waite-Smith model). The court cards are: Servant, Handmaiden, King and Queen, (described in detail as to why). This precious set is available directly from the artist's Blog or her Etsy shop along with other mystical treasures and meaningful works she creates. The deck set is reasonably priced, given the time, the elaborate materials and extensive research put into its creation and all the personal touches which make for a uniquely lovely presentation for each order. It would make a potent reading deck for anyone drawn to this spiritual theme or those entranced by the iconography of religious shrines and alters. It would also be a lovely addition to any collection of those seeking a feminine vision of Goddess power and insight related to Tarot. About Hettienne Grobler: A spiritual healer for years, she has also created the Freedom through Love three year spiritual wisdom course and founded the Shekinah Healing Foundation; formed the Path of Love Wisdom and Mastery School as well as organizing the first international Goddess Conference on the Artemis Farm in Franschhoek. She was initiated as a Shaktypat Guru into the Siddha Yoga lineage in 2008 and founded the Temple of Mary at Sancta Maria, Durbanville in 2012. She is the Vision keeper Hettienne Bhakty Ma Maria at the Temple where East meets West. After years of dedication and study she completed this inspiring Mysteries of Mary Tarot Deck in 2016. Aside from her Blog journal, Ms Grobler also has an Etsy page with a unique selection of sacred and handmade offerings.